Ask fellow campers about "Harmony Lakeside RV Park" and nearby attractions. We stayed 8 nights in a 40' fifth wheel. We love this park. It has many interesting site options at different levels going back to the lake. The drives and sites were mostly very well laid out and they have a bunch of cabins also. They will have a new section open next season with 43 sites but that land is a former ball field so there are no trees or ambiance like the old section. We were in site 77 on the lake for five days and then had to move to site 37. 77 was parallel to the lakefront but a difficult approach for parking our home. The road down to the lake sites is rather steep. Once in, it was great. Trees means debris but that's ok. Site 37 was terrible. Right across from the office and check-ins so very busy with traffic and noise. They have a large boat dock at which they rent slips for your stay. Fishing seemed to be good. We would definitely stay here again or at least sneak in to pick berries. This is a very busy park and very popular with locals. We would definitely stay here again. 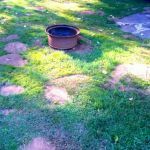 We camped at Harmony Lakeside RV Park in a Fifth Wheel. We enjoyed picking blackberries in many locations around the property so we picked plenty to eat and I made a great pie. This location is convenient to Mt Ranier National Park and far enough away from the Seattle craziness. Didn't find a good restaurant nearby. We stayed one night here. The park itself was OK, our site had plenty of room for our fifth wheel and truck. My husband said the restroom was clean. The plants and trees there are overgrown so we couldn't see much of the lake from our site. The cable TV was a bit fuzzy but OK. There was a path nearby to walk down to the lake and docks. We found that our picnic table was falling apart and needed to be replaced and reported that to management. A maintenance man came and replaced it. We mentioned to the maintenance guy that we had a guests coming for dinner and he suggested a spot nearby where they could park. We also inquired about having a fire and he checked with management, came back and said a fire was OK. I am assuming he mentioned to the office that we were expecting guests, yet he never advised us about the guest policy and the park admin never came by to advise that our guests would need to check in and pay a fee. Our guests were there for about 4 hours then left the park. After they left I found 2 new emails from park management insisting that we come to pay for our guests and advising that day guests have to check in at the office AND pay a fee to be there AND pay another fee to have their vehicle there. I checked the park website, saw that additional fees would be charged for guests but I would interpret that as an overnight guest. My husband went into the office the next morning to complain about the extra fees and was told that it didn't matter how long the guest stayed, 5 minutes or overnight, there would be a charge and said this information was sent to us with our reservation confirmation. We don't recall ever seeing this and have never stayed at a park where there is a charge for day guests. The park did finally agree to waive the guest and vehicle fees however, we wont stay there again, felt that the park had too many additional fees. We camped at Harmony Lakeside RV Park in a Fifth Wheel. This park is off the beaten path but a nice park. It was tight for us in a 43' 5th wheel. It's a quiet park and you don't have road or train noise. It's also located on Mayfield Lake. We camped at Harmony Lakeside RV Park in a Fifth Wheel. They rent boats, kayaks and paddle boards and we took advantage of this since the dock was at the bottom of the hill of the park. This is a quiet, nicely groomed and clean park. Good water pressure but the wifi was problematic. They use Tengointernet. Had a hard time just checking email. Sites were level. Would stay here again if in the area. We camped at Harmony Lakeside RV Park in a Fifth Wheel. Near Mt. Rainier and Mt. St. Helens. Small town about 4 miles away. Owners checked us in. Friendly and quick. Beautiful view of a lake from most spaces. At some point there was a lot of time and money invested in the landscaping. Today it is a bit unkept looking. We had a great space but could never get level. All roads are well kept gravel. It appears many guests are permanent/seasonal with canbins and RV's in various areas. We never got the feeling that the regulars felt the need to greet those that were there for a short stay. Pretty Park but we were not sorry to leave. Good base got Ranier/ St. Helens although they still are a full day drive Probably still best option in the area. We camped at Harmony Lakeside RV Park in a Motorhome. Not much in terms or restaurants. Morton is 15 miles and covets the basics. I loved this campground and the meandering way it's laid out with the campers and cabins mixed in together. . There are trees and flowers and the buildings are well maintained. It's a very clean campground with super friendly, helpful staff. I did laundry here and the dryers run for the longest of any I've ever seen and even my towels got dry. It's conveniently located if you are planning to see both Mr. Rainier an Mt. St. Helens. There are even wild blackberries to pick. We would definitely stay here again. We camped at Harmony Lakeside RV Park in a Fifth Wheel. This was a great park. We were right on the lake with a huge site. It was very private. The owners were very nice. We stayed during the week so it was not busy. The lake is beautiful and the area is beautiful. We camped at Harmony Lakeside RV Park in a Travel Trailer. This park has a nice mountain feel with the large trees and location right on the lake. The sites are gravel and tight and the hookups are long for many of the sites. The park has a small bathroom & shower room, volleyball area, horse shoes, a dock for boats and a fish cleaning station. See our full review at www.thegilliamsisland.com We camped at Harmony Lakeside RV Park in a Motorhome. Nice quiet park. Many options for entertainment (lake fishing, boating, pool, playground). Sites were a little tight and on a hillside. Nice trails for walking. 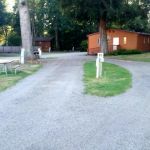 We camped at Harmony Lakeside RV Park in a Travel Trailer. When we made reservations, we were told of various options (back in, pull thru, lakeview and price difference of each) and upon arrival realized that all sites were basically the same: level gravel, truck rim fireplaces, grass areas full of fresh mole dirt mounds, narrow sites, quiet, big rig friendly, pull thrus, back ins and lakeview sites intermixed, good utilities, cable TV and gravel interior roads. Our credit card was charged for first night upon making reservations. Overall, okay but very pricey for size and quality of sites. 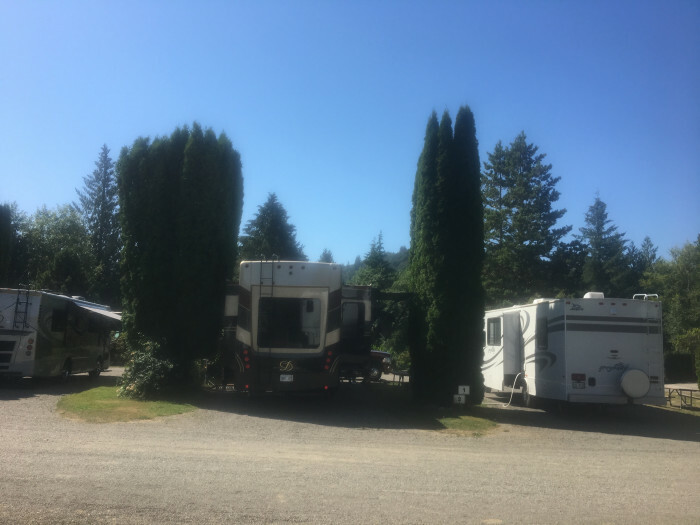 We camped at Harmony Lakeside RV Park in a Motorhome. 90 miles to Sunrise Visitor's Center at Mount Rainier and 65 miles to Paradise Visitor's Center at Mount Rainier. The people working here are very accommodating and friendly. Sites are nice and some are secluded with trees. Cabins are spotless. The only thing when traveling with kids: no big toys and very limited beach for play. Great park overall. We'd return! We camped at Harmony Lakeside RV Park in a Travel Trailer. Excellent spacing for sights,good hookups. Nice person at the front desk. We camped at Harmony Lakeside RV Park in a Fifth Wheel. Overnighted at this campground. The staff was extremely pleasant and found me a campsite even though I had no reservations. The campsite was shaded and separated from surrounding campers by trees and bushes, however, rigs are a little too close for my preferences. Campsites, park models, and permanent structures are scattered throughout. LOTS of kids all over, riding their bikes and running through campsites. Also quite noisy. For me, it was fine for one night, but I was eager to leave in the morning. 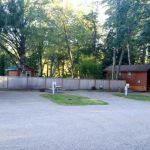 We camped at Harmony Lakeside RV Park in a Travel Trailer. We stayed in space 38 with a 36' motor home...it is across the drive from the office and parking area where everyone stops to check-in, you feel like you're in the middle of a traffic jam all day. The best spaces are 77 and 78 but there are a lot of good spaces throughout. The staff was very helpful and friendly, they also do a boat launch and retrieval for a minimal fee which is a great asset as it allows you to bring your own boat. Overall a very nice place with great access to the Cowlitz River and Mayfield Lake. We camped at Harmony Lakeside RV Park in a Motorhome. Very nice park with good views of the lake. Back in's along the lake are a little funky to get into but, do able and well worth it. Nice folks that run it. Close to Mt Rainer and Mt St Helens NP. We camped at Harmony Lakeside RV Park in a Motorhome. The best views for Mt Helens are thru Gifford National Forrest on NF-25 from Rt. 12 in Randle . Its the only place to see Spirit lake. The federal road side of Helens is not as good. 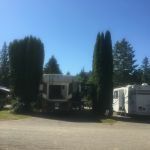 Are you affiliated with Harmony Lakeside RV Park ?